Sablefish, also known as black cod, is an extremely flavorful fish that is widely considered a delicacy in Japan and is becoming more popular by chefs in the U.S. An excellent alternative to Chilean sea bass, a simplistic preparation method really accents the rich, buttery flavor and texture. With its beautiful snow-white fillet and perfect flake, sablefish is a premium whitefish choice for sautéing, poaching, or roasting. Season with salt, pepper, and favorite herbs, then sprinkle with lemon juice and bake, or marinate it and choose to grill or broil it. 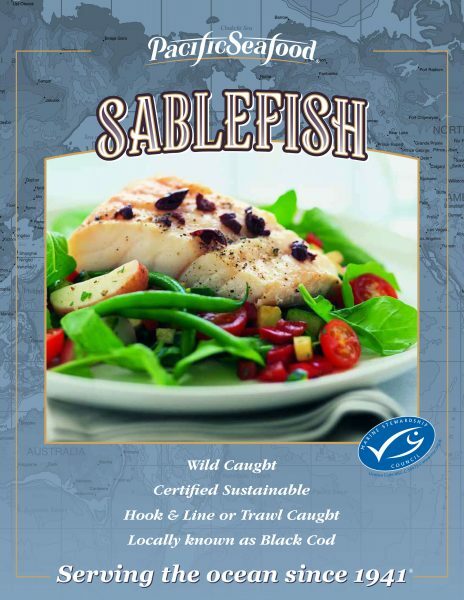 Sablefish is rich in omega-3 fatty acids, yielding a fish that is an excellent source of high-quality protein and eating enjoyment. Pacific Seafood is proud to offer this unique and tasty fish as an excellent value much of the year.